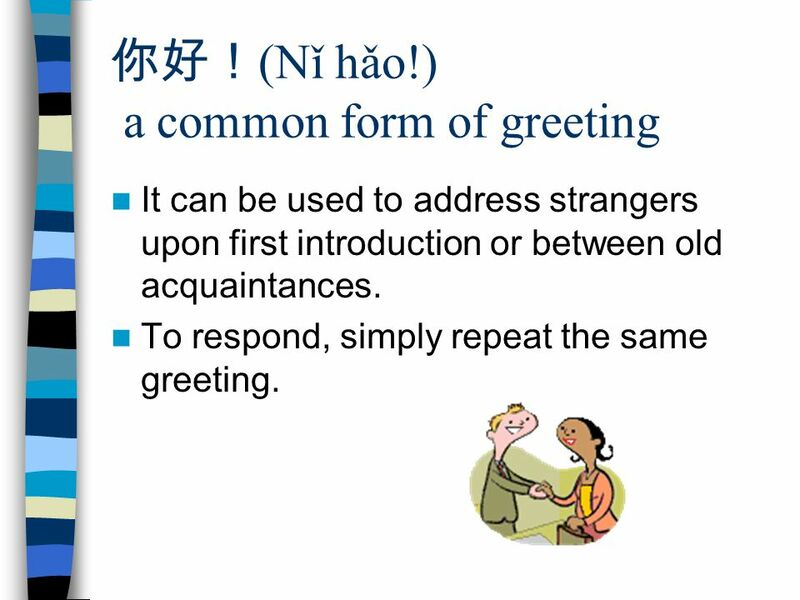 It can be used to address strangers upon first introduction or between old acquaintances. To respond, simply repeat the same greeting. 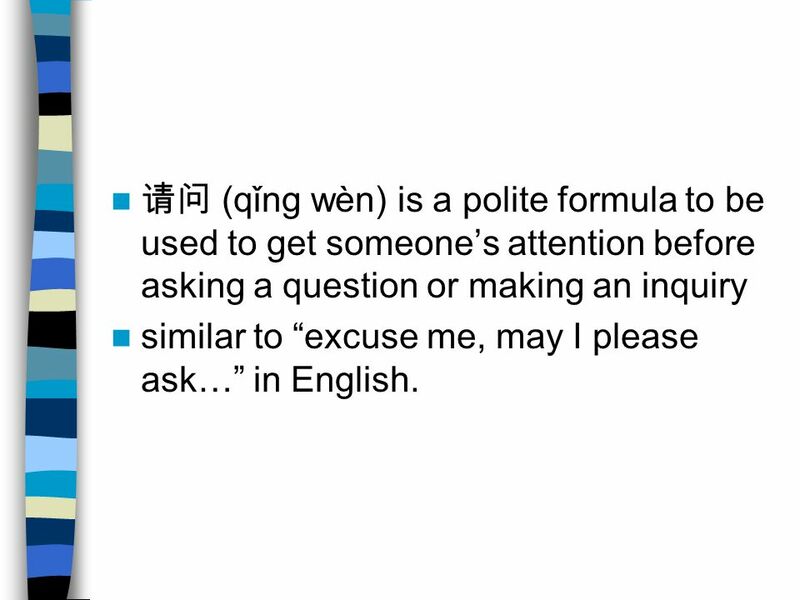 3 请问 (qǐng wèn) is a polite formula to be used to get someone’s attention before asking a question or making an inquiry similar to “excuse me, may I please ask…” in English. 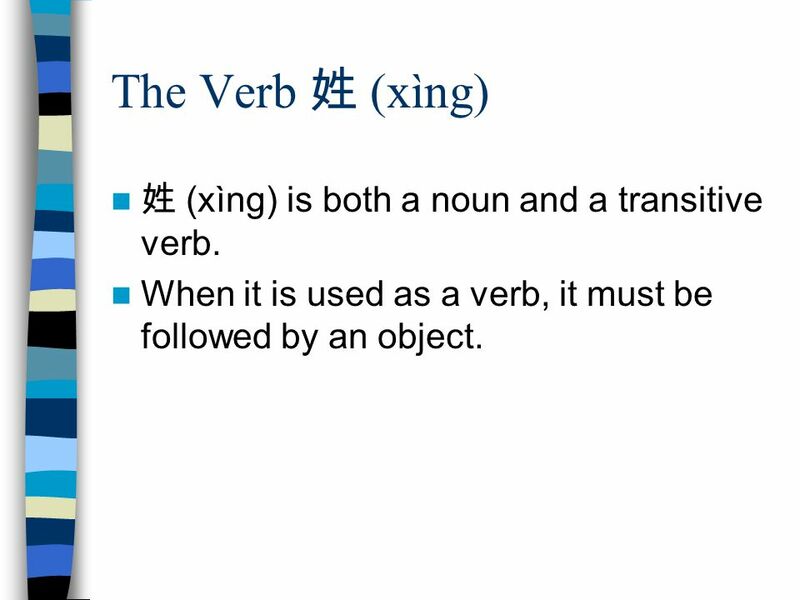 5 The Verb 姓 (xìng) 姓 (xìng) is both a noun and a transitive verb. When it is used as a verb, it must be followed by an object. 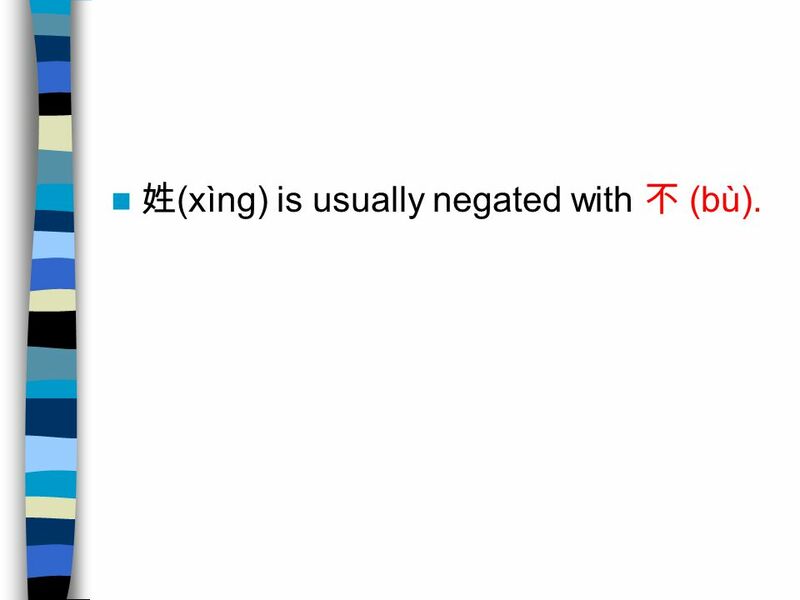 7 姓(xìng) is usually negated with 不 (bù). 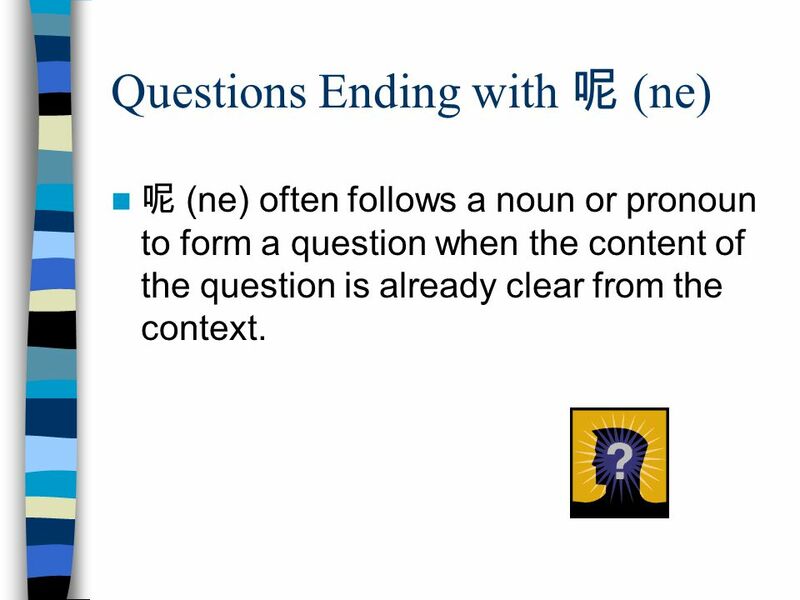 呢 (ne) often follows a noun or pronoun to form a question when the content of the question is already clear from the context. 13 A: B: What’s your name? 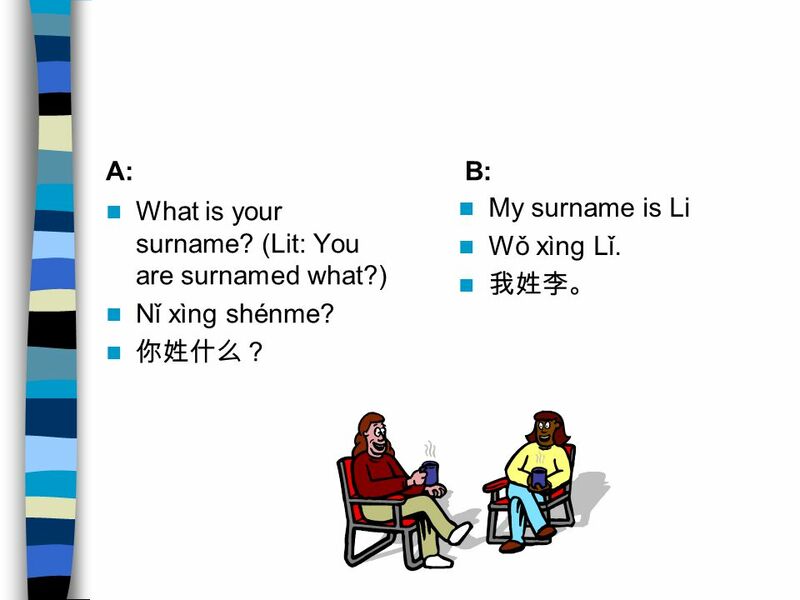 Nǐ jiào shénme míngzi? 你叫什么名字? 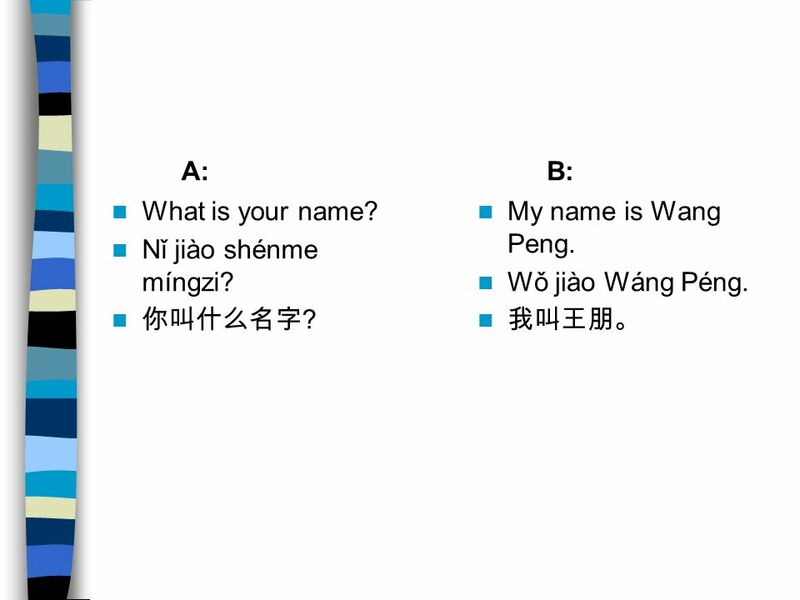 My name is Wang Peng. How about you? Wǒ jiào Wáng Péng, nǐ ne? 我叫王朋，你呢? 14 When 呢 (ne) is used in this way, there must be some context. 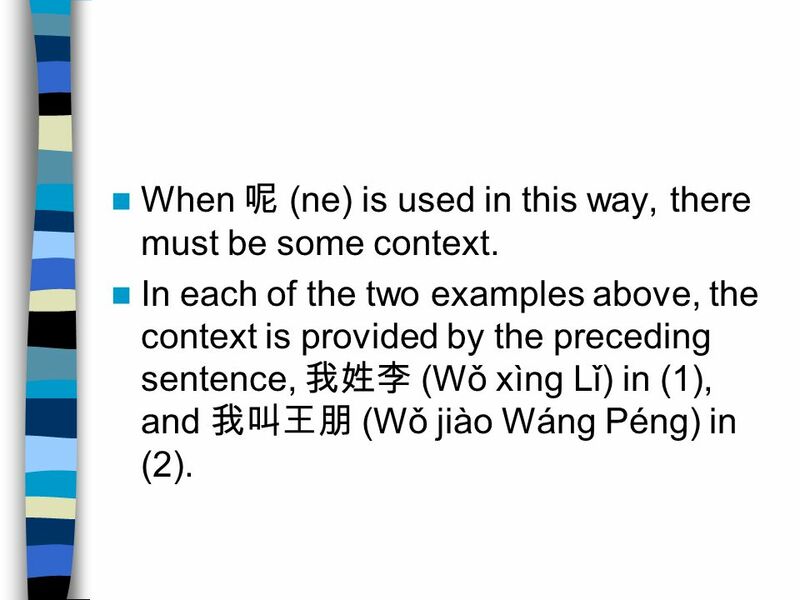 In each of the two examples above, the context is provided by the preceding sentence, 我姓李 (Wǒ xìng Lǐ) in (1), and 我叫王朋 (Wǒ jiào Wáng Péng) in (2). 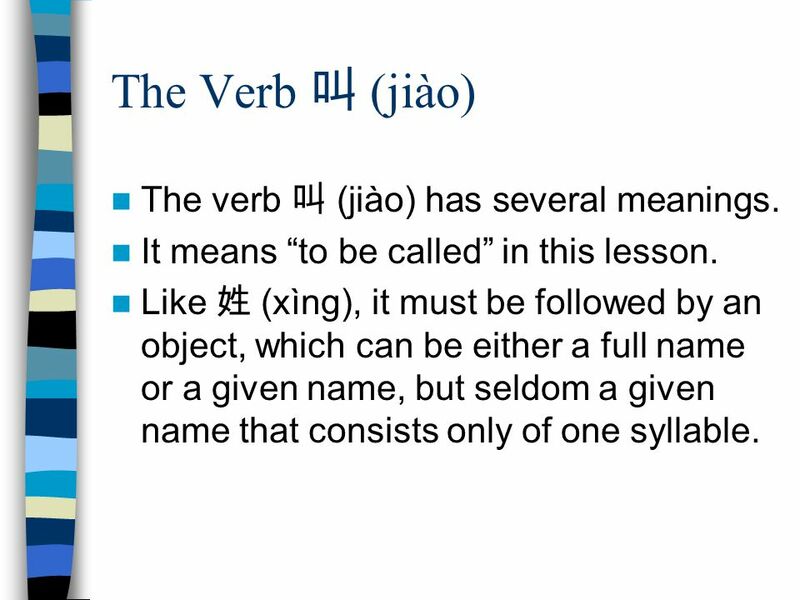 15 The Verb 叫 (jiào) The verb 叫 (jiào) has several meanings. It means “to be called” in this lesson. 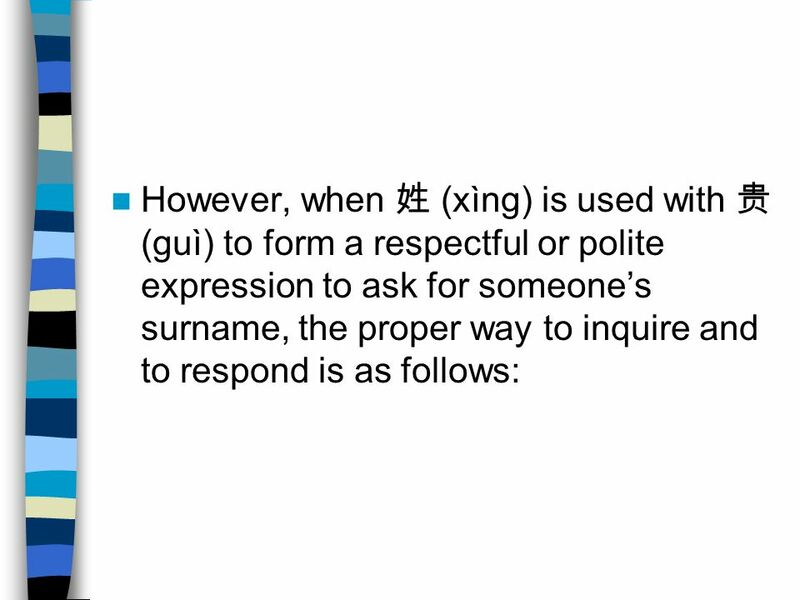 Like 姓 (xìng), it must be followed by an object, which can be either a full name or a given name, but seldom a given name that consists only of one syllable. 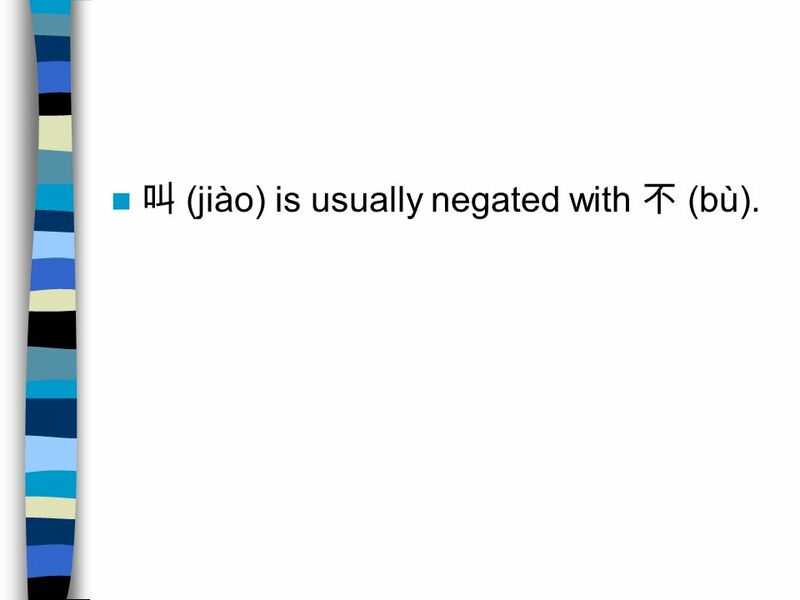 17 叫 (jiào) is usually negated with 不 (bù). 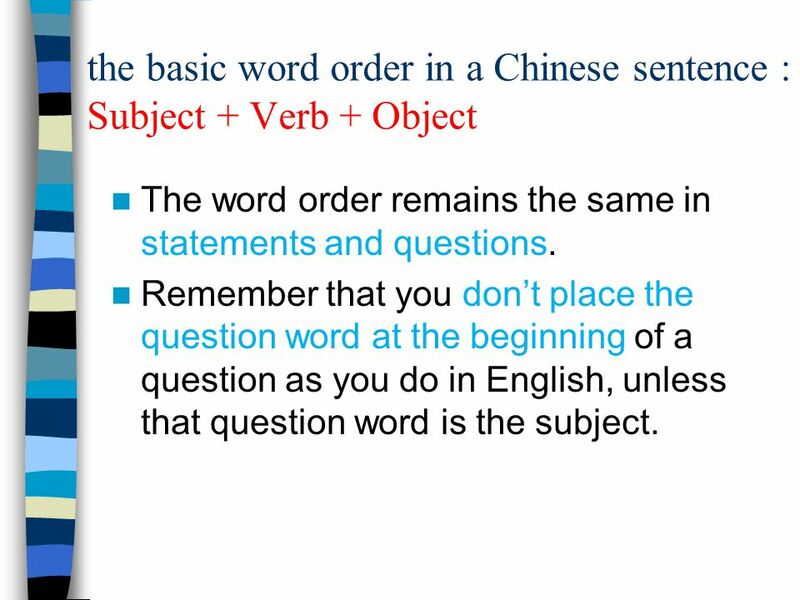 The word order remains the same in statements and questions. Remember that you don’t place the question word at the beginning of a question as you do in English, unless that question word is the subject. 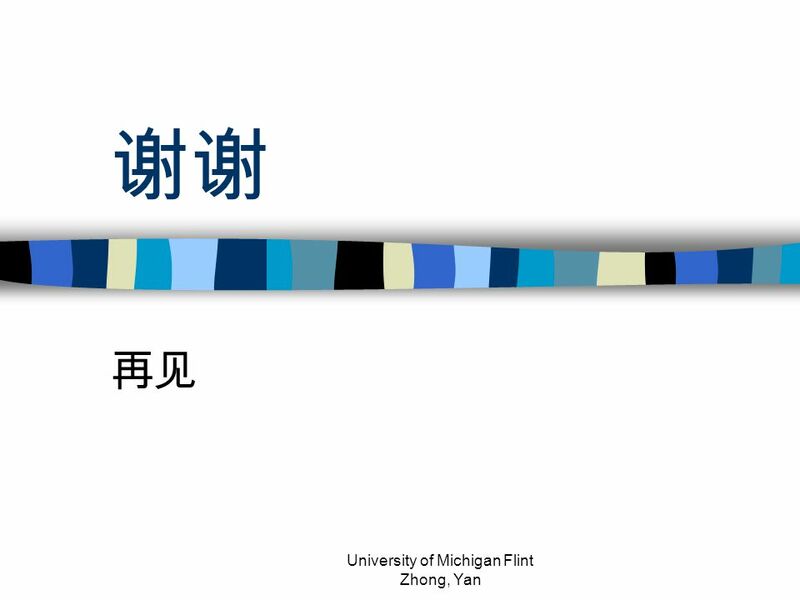 Download ppt "University of Michigan Flint Zhong, Yan"
Copyright 2007, Ginger Lin Chinese Step by Step Copyright 2007, Ginger Lin Session 1 Getting to Know Somebody. Copyright © 2009 Lumivox International Ltd. Daily- Hello Daily- Hello Level: Beginner Dialogue New words Sentence pattern Exercise. 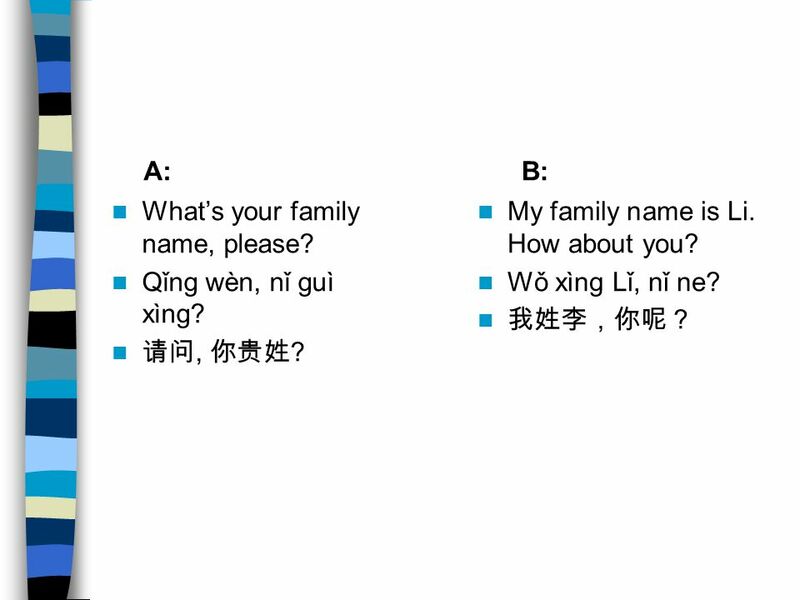 Lesson 3 Dialogue 2 Grammar University of Michigan Flint Zhong, Yan. 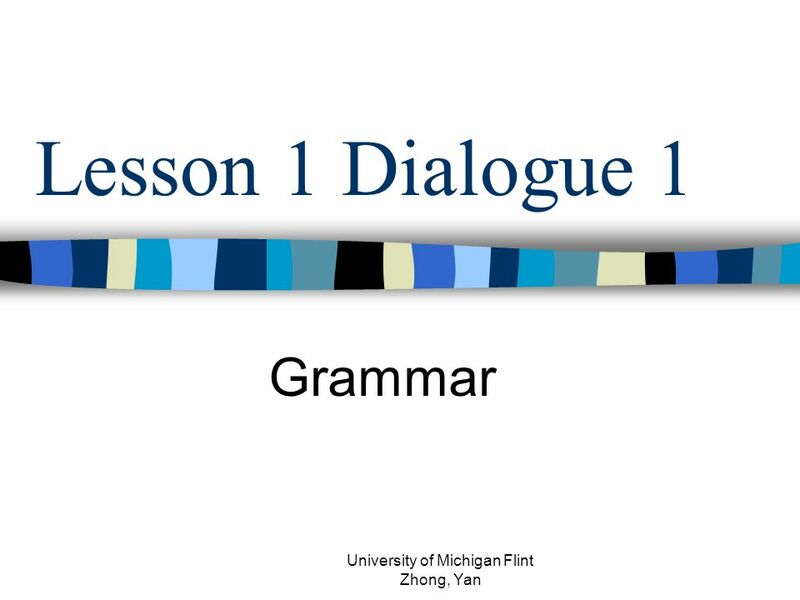 Lesson 2 Dialogue 2 Grammar University of Michigan Flint Zhong, Yan. Copyright © 2011 Lumivox International Ltd. Learning Goals 1.How to ask for permission; 2.How to ask someone’s name. 3.How to introduce oneself. Learning. 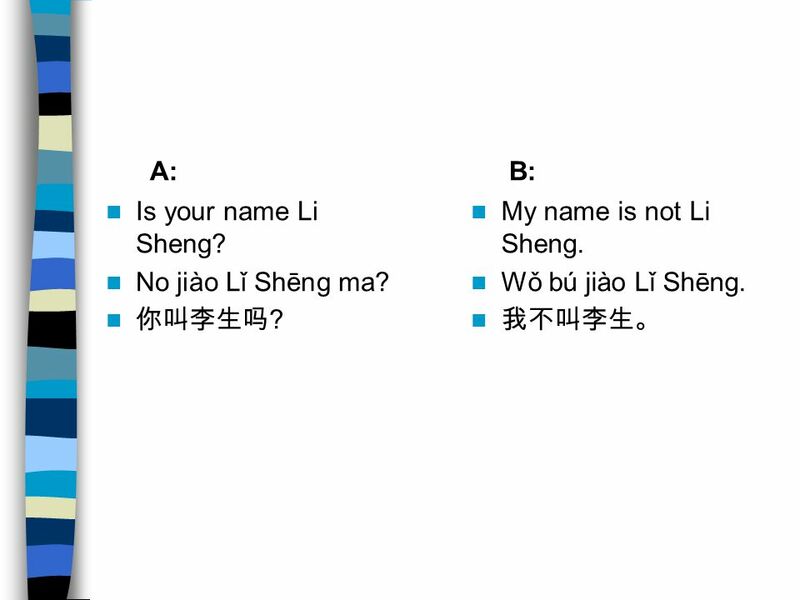 Lesson 14 Dialogue 1 Grammar UM Flint Zhong, Yan. 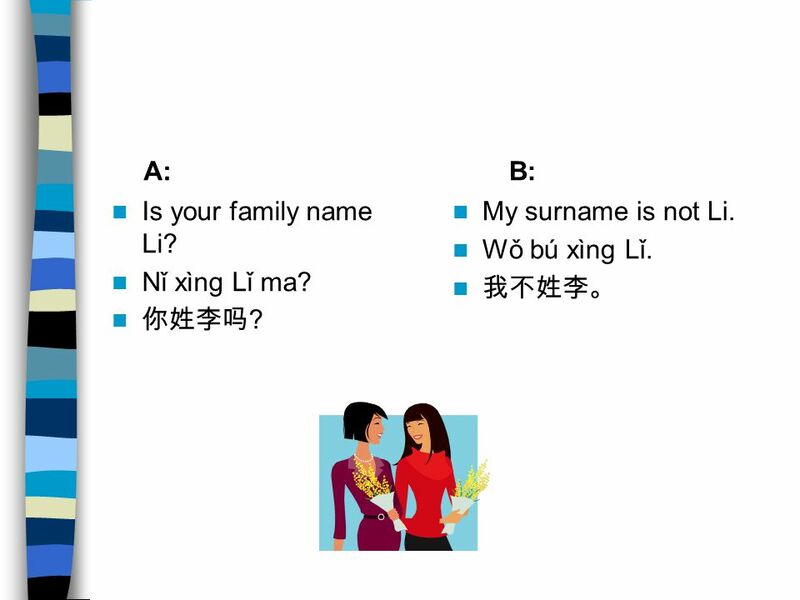 Lesson 4 Dialogue I Grammar University of Michigan Flint Zhong, Yan. Resource: Integrated Chinese part1 Salutacion Leccion 1. 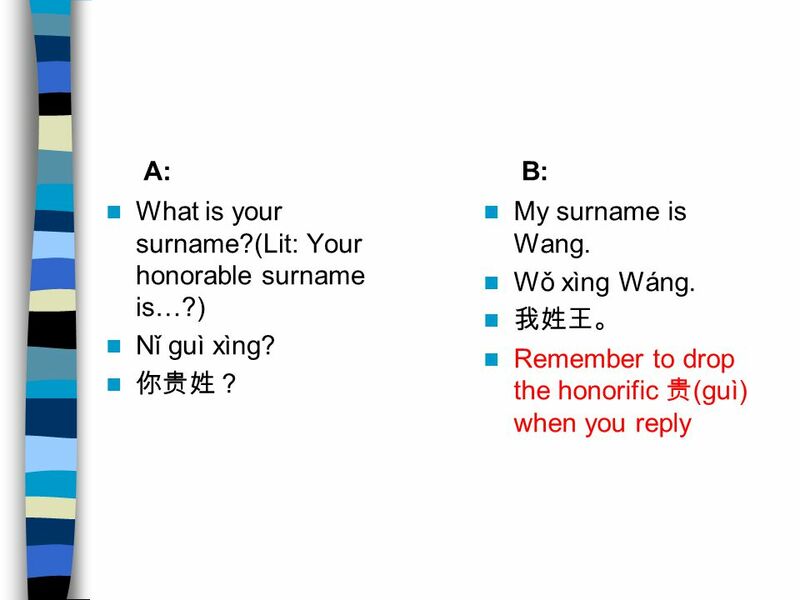 Lesson 1 Dialogue 2 Grammar University of Michigan Flint Zhong, Yan. 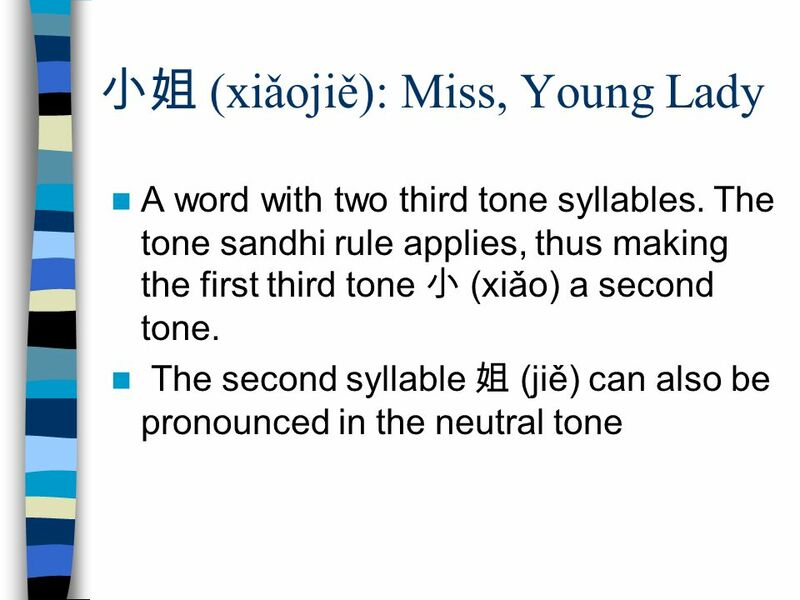 Lesson 9 Dialogue 1 Grammar University of Michigan Flint Zhong, Yan. Lesson: Numbers 零 líng0 zero 一 yī1 one 二 èr2 two 三 sān3 three 四 sì4 four 五 wŭ5 five 六 liù6 six 七 qī7 seven 八 bā8 eight 九 jiŭ9 nine 十 shì10 ten 一百 yìb ă. Survival Chinese Greetings!. CONTENTS 1 Greeting and Name. 2 Requesting Names 3 Politely Requesting 4 More! 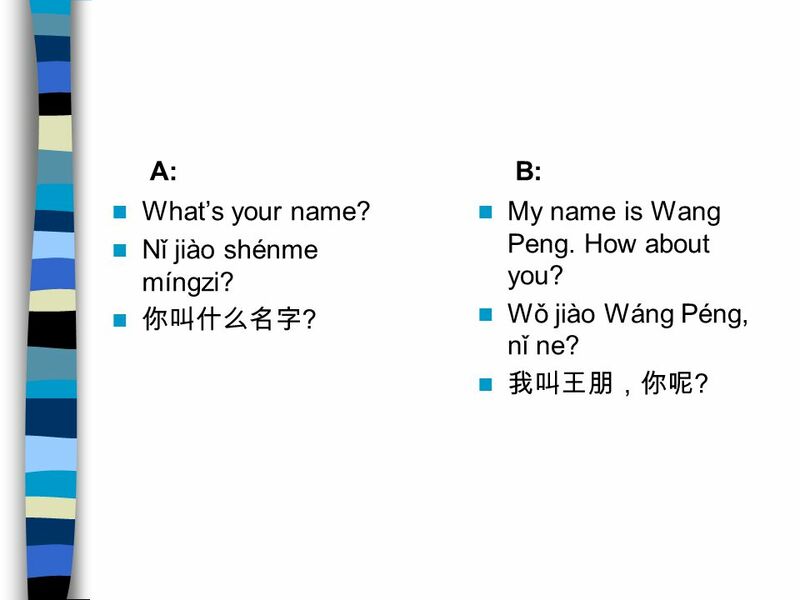 Lesson 4 Dialogue 2 Grammar University of Michigan Flint Zhong, Yan.